Necessity—being the mother of invention—was the inspiration behind the amazing Web builder, Webydo. Tired of spending their startup’s limited funds on Web developers to write code for their digital advertising firm, co-founders Shmulik Grizim and Tzvika Steinmetz created a code-free Web builder that not only frees up funds, but also provides designers a more efficient creation process. Built by designers for designers, Webydo provides users a platform for creating sharp, stylish web pages. The builder’s themes are centered more on functionality rather than appearance, giving users free rein to showcase their design creativity. The results are advanced, above average in comparison with its peers as you can create polished portfolios, sleek business sites, and online stores. I took Webydo out for a test drive, looked under the hood, and kicked the tires. What follows is my review of the dapper, code-free Web design tool. Webydo was built by web designers to be used by web designers to create and manage multiple websites for their clients. Prior to Webydo, designers needed developer skills—or had to hire developers—to write to code for their creative designs. Webydo websites are, in essence, software programs that convert the visual images on the design page in the control dashboard into code that can be displayed on the Web. Prior to code-free design programs, Web developers were an integral component to the Web design process. Webydo has given more backend administrative power to the designer. I found the user interface to be very similar to Adobe Photoshop, ensuring those familiar with the industry standard design tool will feel right at home at the Webydo controls. Ideally, Webydo is best used by experienced Web designers and digital agencies that want to focus their time, efforts, and budget on creative design as opposed to code-based development. The company does not offer a large number of design templates, but that is fine. All Webydo templates are fully customizable. Plus, with all of the design capabilities that the builder provides, a rigid template would almost stunt your creativity. Also, all of the Webydo themes are highly responsive on mobile devices and allow for social media integration. Instead of choosing a design theme, you select a functionality template. From one-page static sites and scrolling sites to sliding galleries, there is sure to be a theme to suit the needs of most designers. Within the templates, I like that you are still able to approach the design elements in different ways. As you begin building in your template, you are offered three starting points: inspiration, wireframe, and blank canvas. The inspiration mirrors the chosen theme and provides you with an idea of where design elements can live on your page. The wireframe gives you a basic structure to build your page on. And the blank canvas is exactly what you would think that it is: a true Web designer’s laboratory where creative ideas come to life. Webydo is not easy to use for the novice Web builder. The company was created for experienced designers, not novices. That said, anyone familiar with the Adobe suite will have no trouble getting behind the mouse in the Webydo design dashboard. Very much like Photoshop, there are multiple toolbars, each one a Swiss Army knife of design tools. Once you get the hang of it, the Webydo control panel is not at all difficult to maneuver. The dashboard is made up of four components: design, content, edit, and preview. The design mode is where Webydo really struts its stuff. You can turn the canvas into anything that you or your client demands. Content mode transforms the control panel into a content management system (CMS), allowing you to update content without changing the design. The text editor is one function that even the first-timer can easily master. This handy tool lets you make a small change and apply it on a global scale, saving time and effort. Finally, the preview mode shows you the final versions of your page across all device screens. With access to so many design tools, it’s no wonder that Webydo can be a little tough to master. However, for the user with design experience, they should have no trouble getting up to speed. 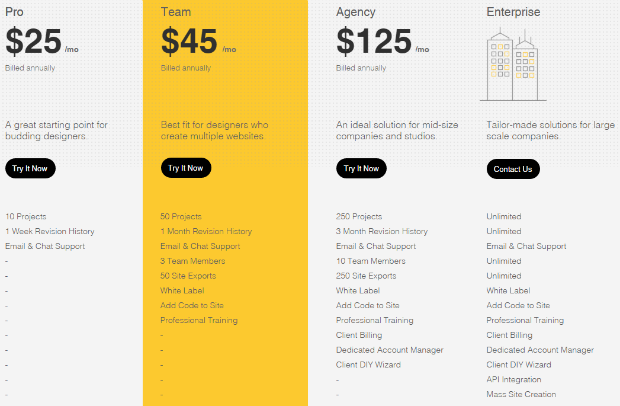 Aside from a free, limited version which only allows for a five-page subdomain, Webydo offers four paid plans that can cover an individual designer or a whole team of creative wizards. The basic plan is good for one user to create up to 10 online projects. Higher-priced plans allow for more users to have access and more projects to be built. Every plan includes a revision history function that lets you go back and retrieve content from older versions of your site. Plus, you get the amazing Webydo support once you sign up, too. Webydo costs can vary, so check the company’s website for the current rates. Also, hosting and a domain connection are available for a monthly fee. The company offers discounted academic plans for students, too. In my opinion, this is where the company really shows its stuff. With Webydo, you can control all of the mobile and static versions of your site through one dashboard. That means you don’t need to have an individual control panel for every screen-type. The Webydo mobile responsive breakpoints allow you to create a unique design for every device that your site will appear on. Webydo knows that mobile is king and their builder lets you create pages that look and function just as well on a tablet or smartphone as they do on your laptop. Created with the designer in mind, the company does not offer a full array of what would normally be typical site features. As such, you will not find any built-in e-commerce capabilities. You can open a Webydo store, though, by incorporating a third-party shopping cart and payment gateway. Webydo uses Ecwid, which is strongly integrated with the studio. Some recent editions of third-party widgets such as Paypal, allow you to conduct the transaction directly on your Webydo page rather than being transferred to another site. Like many things with the company, Webydo e-commerce can only be achieved with the help of an outside source. As strong as Webydo is in other areas, I would think that they should have the chops to add some in-house e-commerce functionality. Maybe someone will vote for that (see the Webydo Customer Support section below). There is no denying that Webydo is a top-of-the-line design tool. Users can craft beautifully refined websites that function impeccably on all screens. With no restrictive design themes, users have carte blanche over the look of the page, making each web page a completely unique site. Aside from producing professional-looking websites, there is little else in terms of built-in capabilities, though. Here are a look at my top three pros and cons for anyone who might be considering Webydo. Total Control: Designers are not forced to use cookie-cutter templates. Mobile Responsiveness: Set your own breakpoints for hand-held devices. SEO Tools: Create organic Web traffic at no additional cost. Ease of Use: Steep learning curve is not beginner-friendly. Lack of Widgets: Fewer available widgets than most builders. E-commerce: No built-in e-commerce functionality. Webydo support comes in a few different forms. The most convenient method is to reach out via live chat or phone 24 hours a day through support page in your account portal. If it’s not urgent, you can submit a help ticket to the customer contact team. More often than not, though, you will be able to find the help that you need though the expansive video knowledge base of Webydo tutorials—especially for builder-related questions. In the spirit of self-improvement through participation, one of the coolest support options that Webydo offers is its various feedback pages. 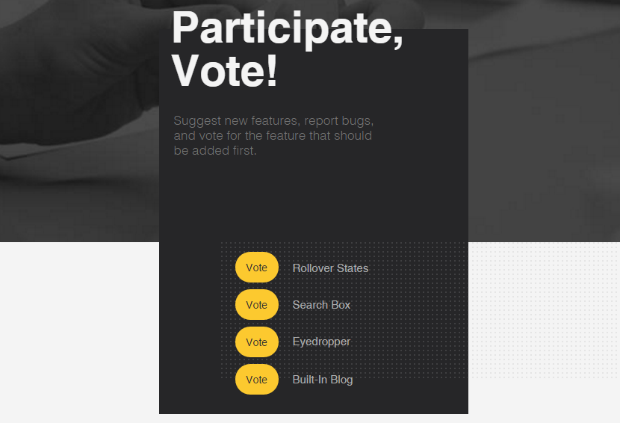 Users can report any bugs or inconsistencies, suggest a new feature, and vote to have their favorite new idea implemented. The Webydo SEO features are very solid. Perhaps the best part is that they are included with every plan, so there is no extra charge for this benefit. You can create meta tags for each page of your website, connect Google Analytics and Webmaster tools, and redirect visitors from your old site to your new Webydo page. Any of these SEO tools will help increase organic traffic to your site. Having them for free? All the better and a huge benefit for users. Once you have your site built, you will need a place to host it. In addition to the building pricing plans, Webydo hosting can be added for any website for a nominal fee (currently $5 a month). When you look at what you get in return, it’s money well spent. Your site will be hosted on the Google cloud. Plus, you get unlimited storage and dynamic content management system (CMS) capabilities. You won’t find a dedicated Webydo email feature in the system. That doesn’t mean you can’t create one, though. Like many widgets, scripts, and features associated with so many other builders that are not a part of the Webydo suite, email needs to be added manually. Users can incorporate third-party email functionality by installing it through the Widgets section of the Webydo design dashboard. Once you get your account with the email software setup, you can even add a newsletter sign up spot on your Webydo page. All of the recent Webydo reviews I’ve read seem to be positive regarding the main features and benefits on the company’s SaaS Web design builder. Eliminating the need for time-consuming code written by expensive developers is a game changer. However, the lack of built-in functions like email and e-commerce that other builders typically include for free does cause users frustrations. But for the experienced designer looking to create sophisticated, attractive web pages—pixel perfect sites as the company calls it—Webydo is an amazing tool. Since the builder isn’t for everyone, you can take advantage of Webydo’s free offer to test the waters before you commit, by creating and publishing a five-page subdomain website at no charge. You can keep that site alive as long as you prefer. If you find that you need more room than five pages allow, you can upgrade to a paid plan at any time. Aside from that, all four of the paid plans include a free 30-day trial period before the first billing cycle starts. Webydo is a great design tool—in the hands of the proper user. Seasoned Web design professionals and experienced Photoshop artists will have no trouble crafting stylish, functional, responsive websites. Beginners, on the other hand, will have to log some hours before they are able to replicate the work of their veteran counterparts. Still, with all of the creativity afforded by the Webydo design dashboard, a want for widgets and elusive e-commerce capabilities have many potential customers looking elsewhere. It seems as if Grizim and Steinmetz streamlined the design process at the expense of some fundamental Web builder components. All told, for what it was created for, Webydo delivers in impeccable style.